Discussion in 'Aulani, A Disney Resort & Spa' started by pepperandchips, Mar 18, 2018. We are an early thirties couple and hail from Atlanta, Georgia. In fact, I asked R to take this trip in celebration of my 30th birthday. While I wouldn't actually turn 30 on the trip, R was unable to travel over my actual birthday in August due to the academic calendar, so we opted to celebrate a bit early by leaving just before Memorial Day, 2017. 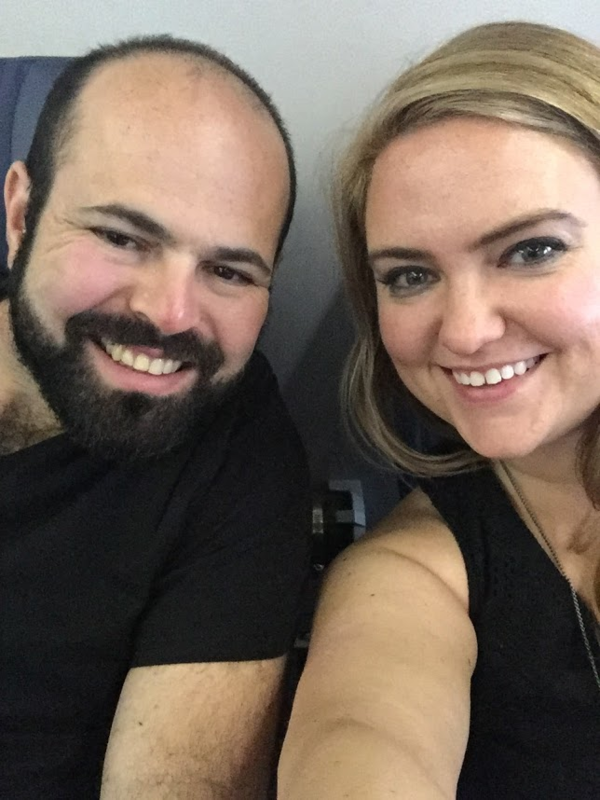 This Memorial Day weekend (2018) will be our wedding weekend, and I really want to share our experience and also document the memories so I can look back on the trip report and the photos in the future. R has begrudgingly become a Disney fan (like he has a choice ) but tells me that he won't admit it if I tell anyone else, so you'll just have to take my word for it. 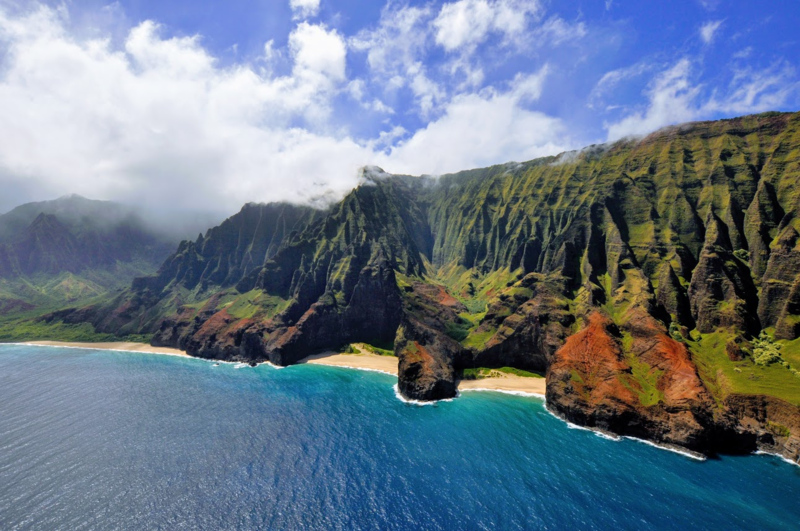 I can't remember exactly why I had my heart set on Hawaii for my 30th but I knew I wanted to visit Disneyland, and when I researched in earnest I set my sights on Aulani (for obvious reasons) and Kauai after seeing photos of the Na Pali coast. 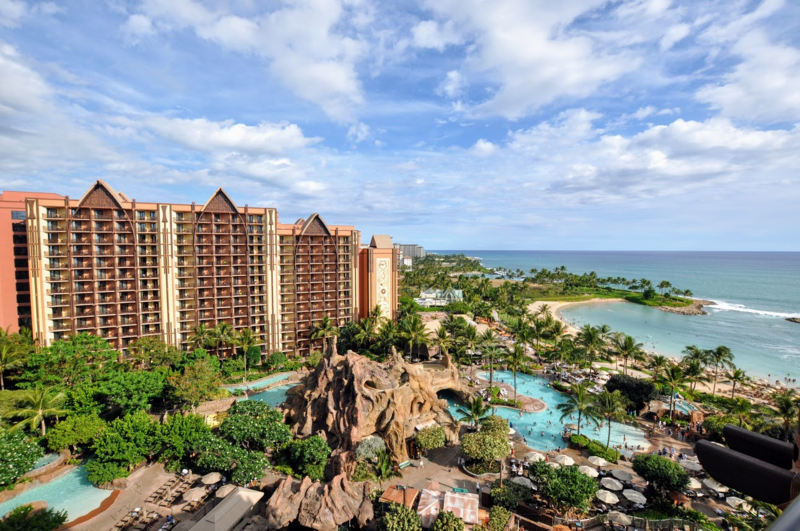 We're DVC and I also had the good fortune of a friend who transferred us some points for that use year, so we were able to book Aulani on DVC points in November when the 7 month window opened. 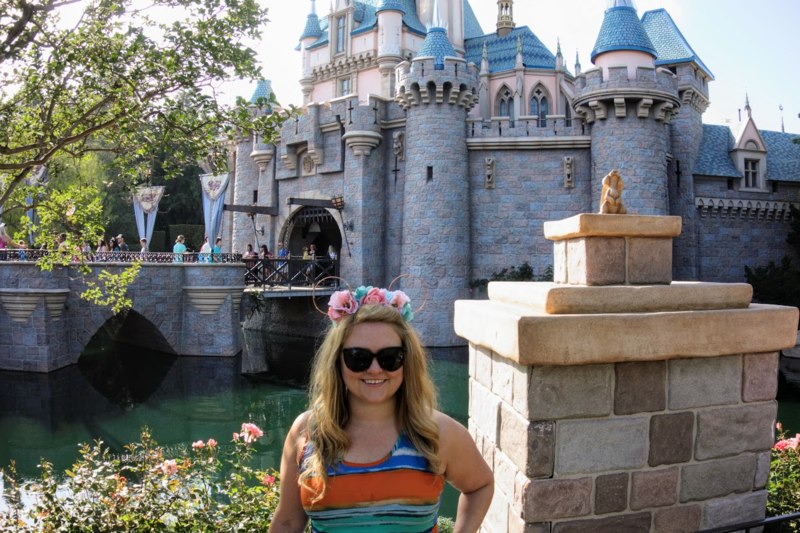 I also waitlisted Grand Californian on a hope and a prayer for our Disneyland stay, and eventually (in January, when I'd just about given up hope) our Grand Californian waitlist matched for 2 of the 3 nights we needed. We spent the last night in Anaheim at the Park Vue Inn just across the street from the Esplanade. 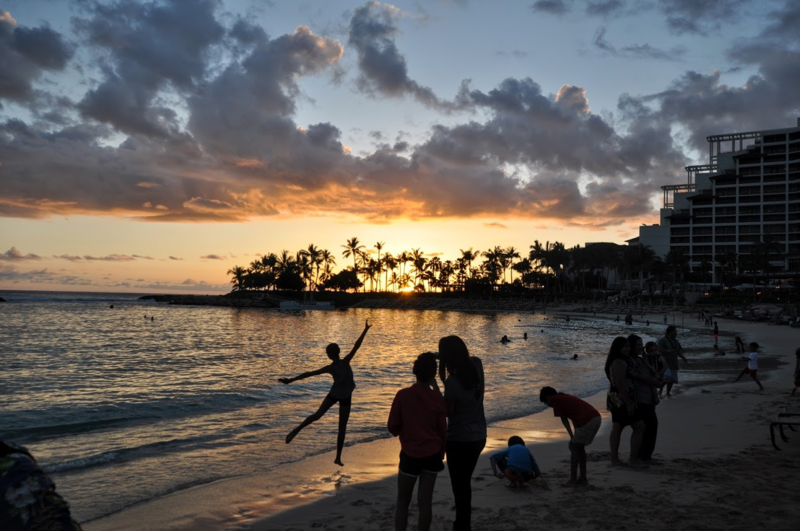 Mind you, it's now a full 9 (almost 10) months after this incredible vacation, and my note taking waned throughout the trip, but I have a plethora of photos and hope to help some other folks planning Aulani stays. If this report devolves into a photo dump, you can't say you haven't been warned! 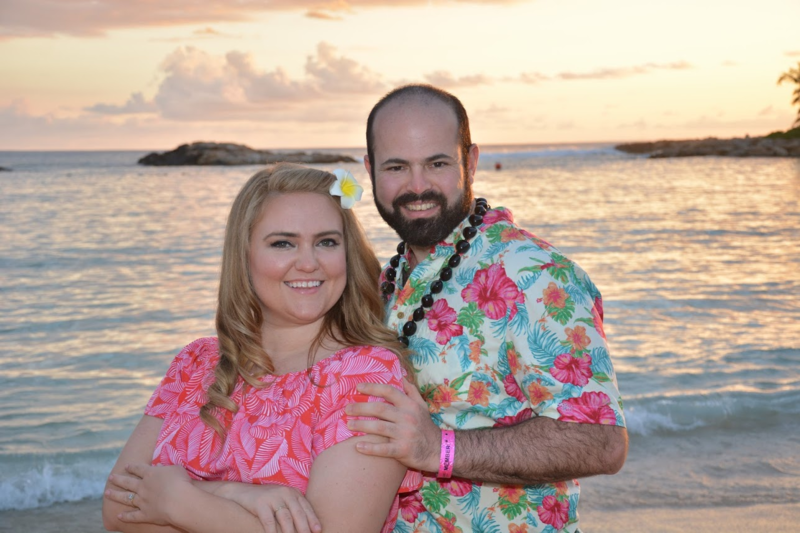 So join us, if you like, for a report retelling of our engagement and absolutely amazing trip to Aulani, Kauai, and Disneyland! buzzrelly, Joed88, Thiago Acquaviva and 10 others like this. 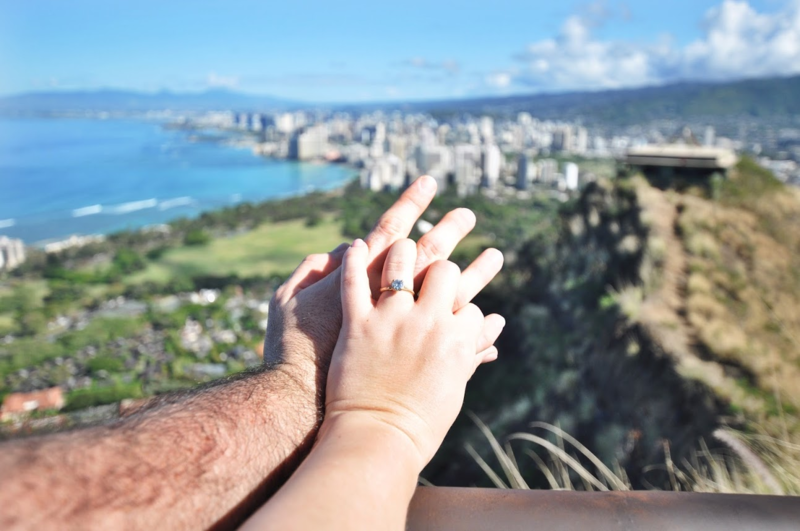 R and I were both scheduled to work a full day on May 26, so we'd scheduled an evening flight for 7:45 pm to Seattle, where we'd spend the night at an airport hotel and connect in the morning on to Honolulu. 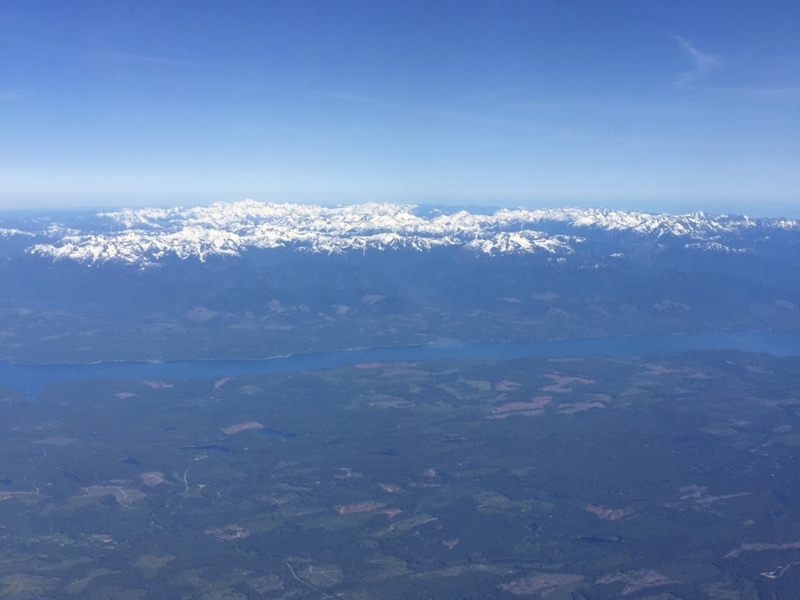 We are definitely not rich, but as a dual income no kids family and with this being a big milestone birthday trip (remember, not engaged at this point) we ended up springing for an amazing rate and getting first class seats for our airfare. 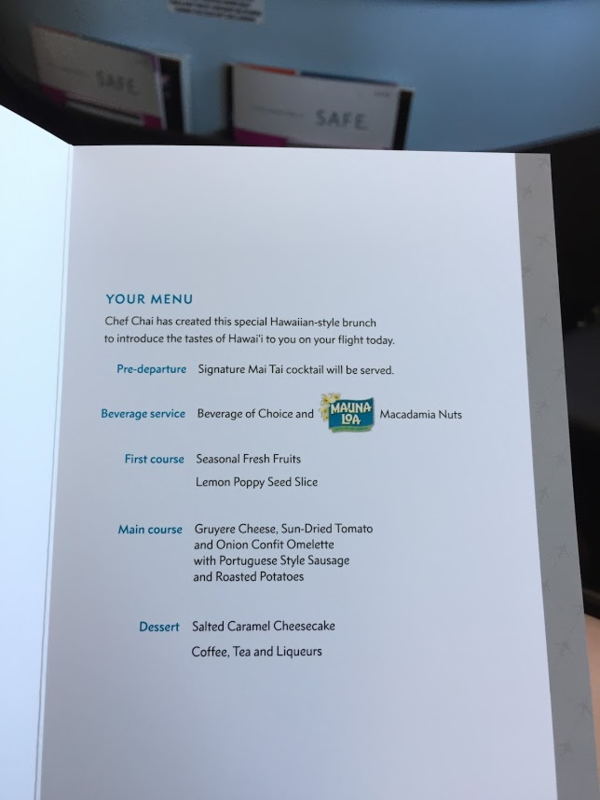 Unfortunately this method required multiple carriers and I never should have allowed myself to experience the absolute luxury of a sumptuous first class flight on Hawaiian airlines. But, alas, I am getting ahead of myself. So throughout the day on Day 0, Delta kept moving around our assigned seats that I had selected when booking our airfare. I was getting irritated with this constant shuffling and, at the time I left the office, they were showing us in comfort plus seats and the Delta 1-800 number had a 3 HOUR HOLD TIME . I figured I would sort it out at the airport as I would much rather be in economy on the way to Hawaii than sitting in Atlanta. By the time we got to the airport, they'd mostly sorted it out, but our flight ended up getting delayed a bit, so I accidentally created the first monster of the trip, and that was using my Delta American Express benefit to buy R and I both guest passes to the Sky Club. My mom used to work for Delta in what was then the Crown Room Club (now it's the Sky Club, but same thing) and so of course the Crown Rooms always seemed to me like the height of grown up luxury. 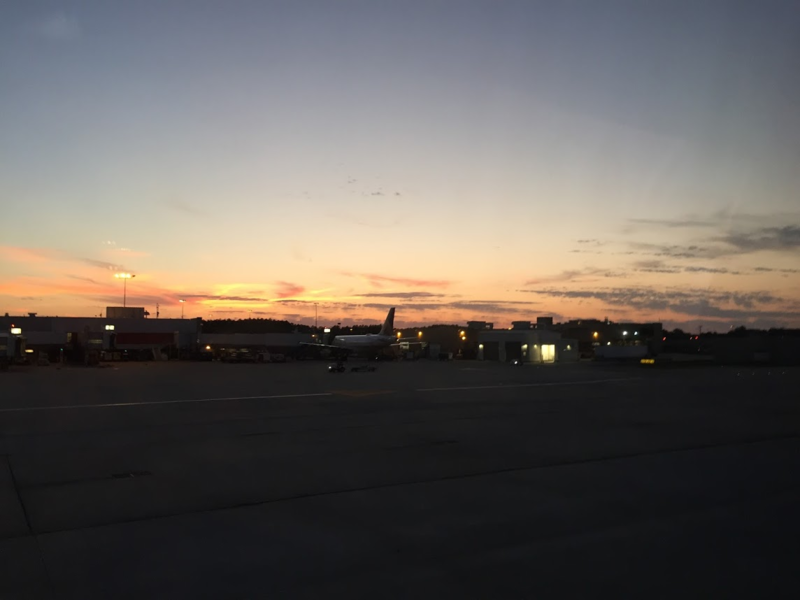 It was a real treat for us to be whisked away from the hustle and bustle of one of the world's busiest airports to the serenity of the Sky Club. We had some soup, pimento cheese, crudites, macaroni and cheese, and chicken salad along with, of course, some adult libations. 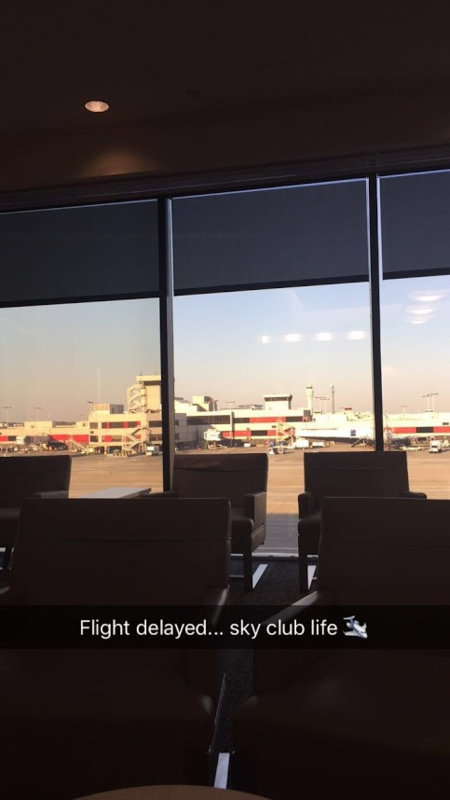 Eventually our flight did take off around 8:30 pm. We were supposed to be in row 3, they ended up bumping us to row 6 after all the moving, but we were happy to just finally be departing for our amazing trip! On the flight I watched a few films including the Descendants, which is set on Kauai and Honolulu, if you have not seen it. I needed to get in the spirit! I had some kinda crappy ravioli and R picked chicken, I think. I knew better than to order airplane chicken. Overall I would say first class on this leg was probably worth it but not something we would necessarily spring for again. 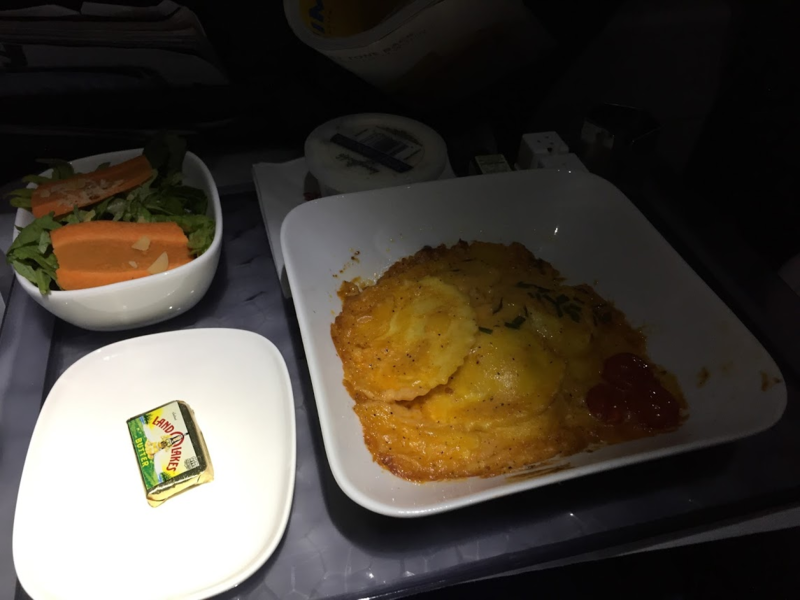 It's about a 5 hour flight from Atlanta, so it was definitely a nice luxury to enjoy the first class service but I didn't think it was so exceptional that I'm spoiled forever. In case anyone is wondering, we stayed at the Doubletree in Seattle. 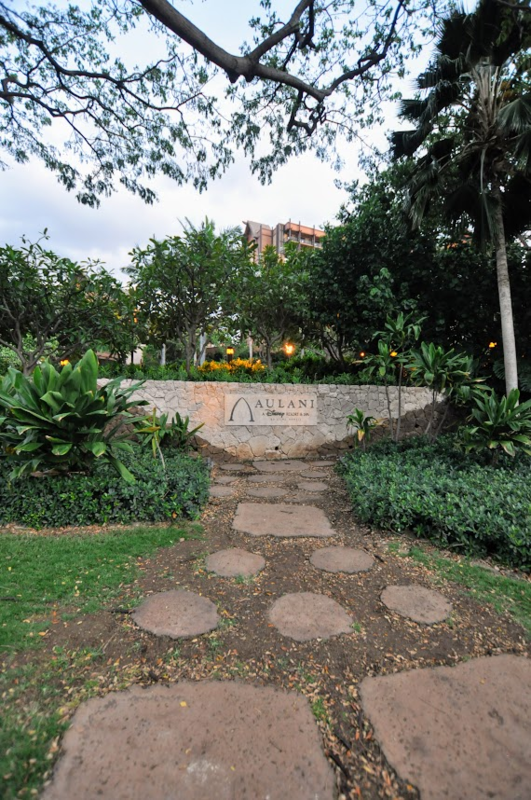 It is located across from the airport and they have an airport shuttle that we used both ways. We had apparently gotten on a shuttle with a plane full of people who had received hotel vouchers for a cancelled flight, so the line to check in after we got off the shuttle was LONG. There was also a video game convention at the hotel and they didn't have nearly enough staff to go around so there was a lot of trash piled up. It didn't help that it was about 2:40 am our time when we were waiting to check in. As soon as we got our room, we crashed. The next morning dawned absolutely beautiful - we loved seeing Mount Rainier from the airport. Our flight was at 9:00 so we were pretty well starving by the time we hit the airport, so we had some crappy airport food while we waited to board. 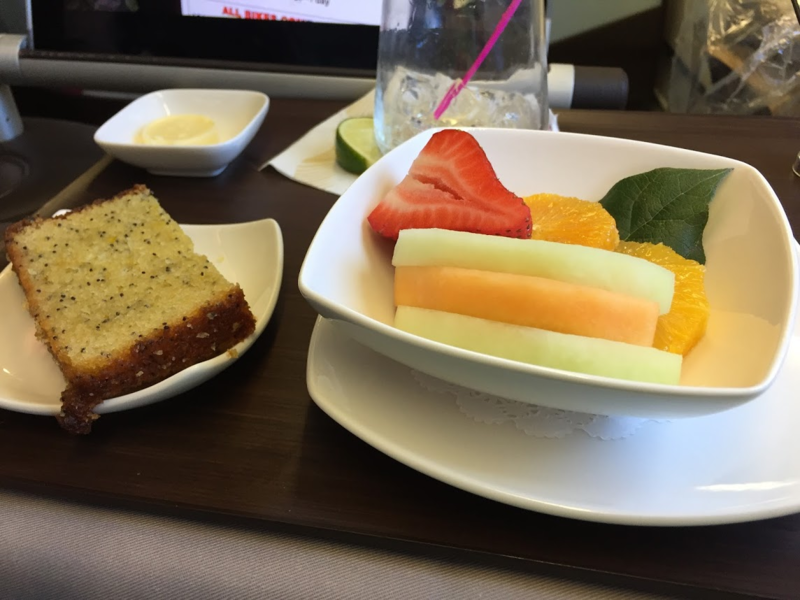 We should not have eaten in the airport - Hawaiian airlines is amazing but I had no way of knowing that! 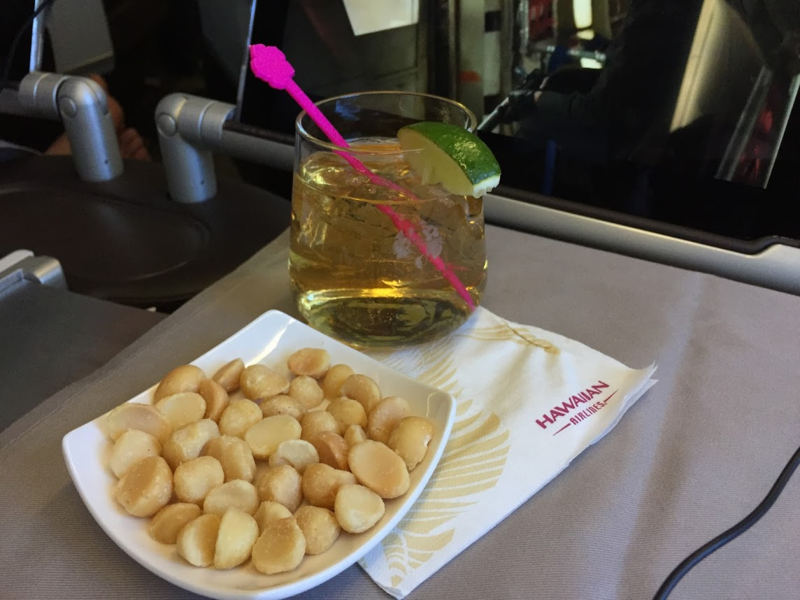 Hawaiian First Class is the definition of decadent air travel. Okay, it's not Emirates or whatever, but I certainly don't usually fly this fancy. 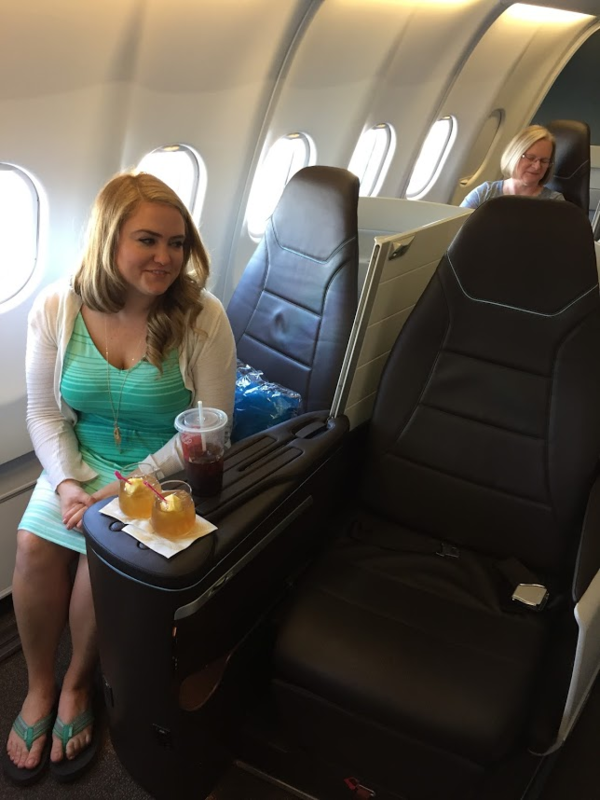 We had lay-flat seats, individual iPads for in flight entertainment, and unparalleled service. Our seat neighbors asked us if we were on our honeymoon. We giggled. Someone is not great at keeping secrets so I had an idea that a surprise was in the works. 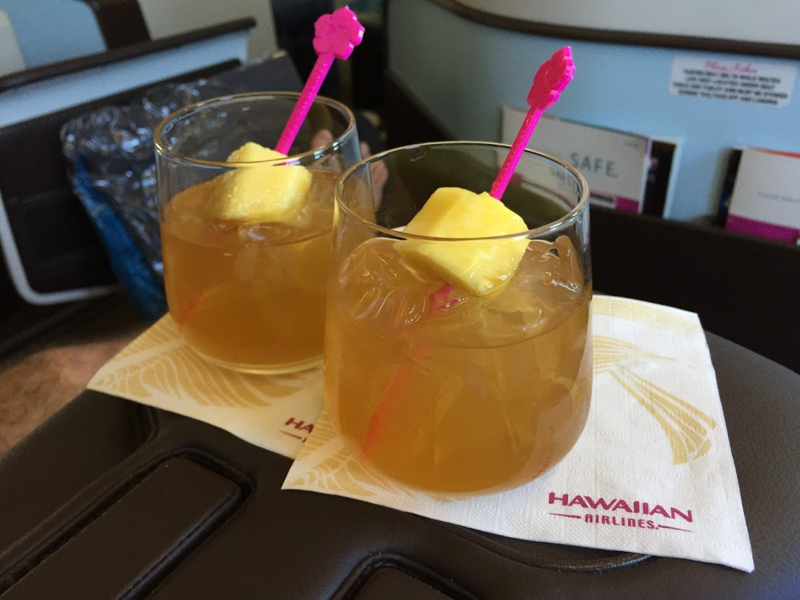 Hawaiian is known for serving mai tais in flight. These were our first of the trip! We laughed a little to ourselves after being asked if we were joining them for brunch. Like uh nope we're just going to go get breakfast from somewhere else on the plane. Yes, of course, bring us food! 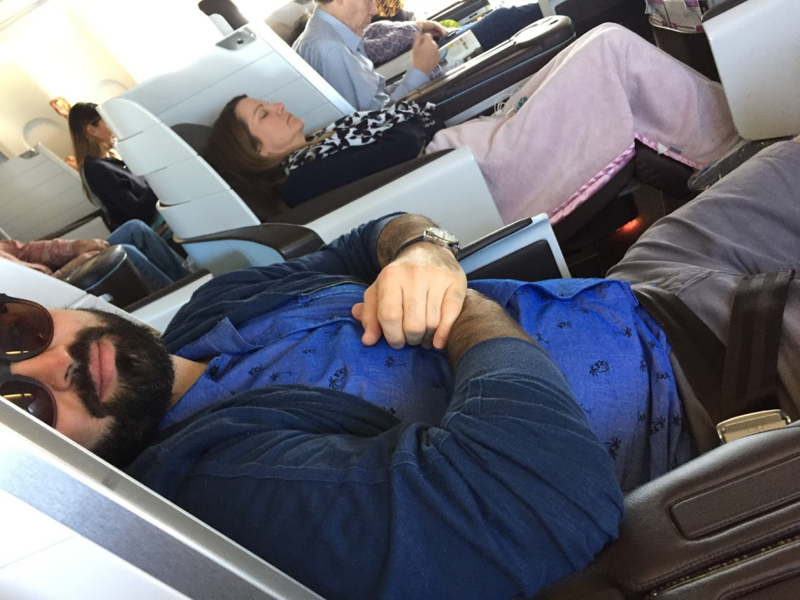 Some passengers made themselves quite comfortable for the long-ish flight. It was almost 6 hours, if I recall correctly. 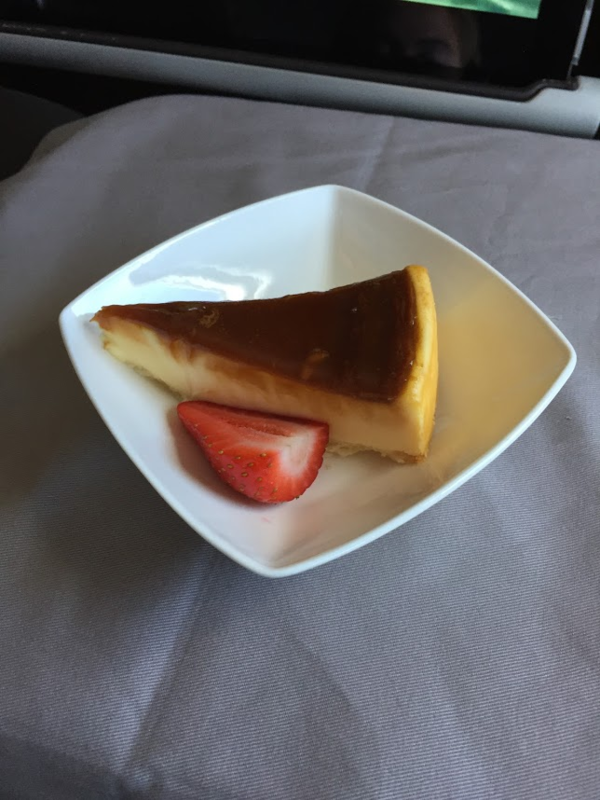 We passed a good amount of the time during the first half of the flight eating the multi-course brunch we were served. The food was mostly really good. 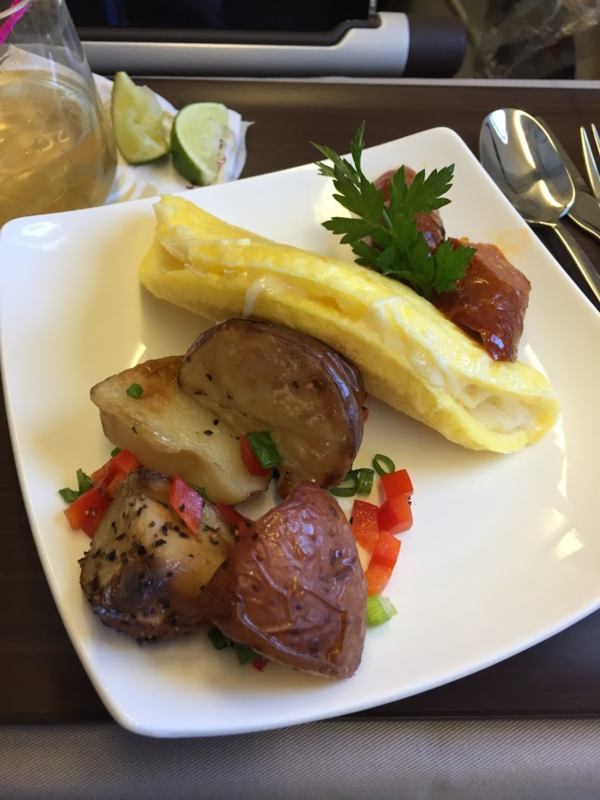 The eggs and potatoes were just ok, but it was airplane food. 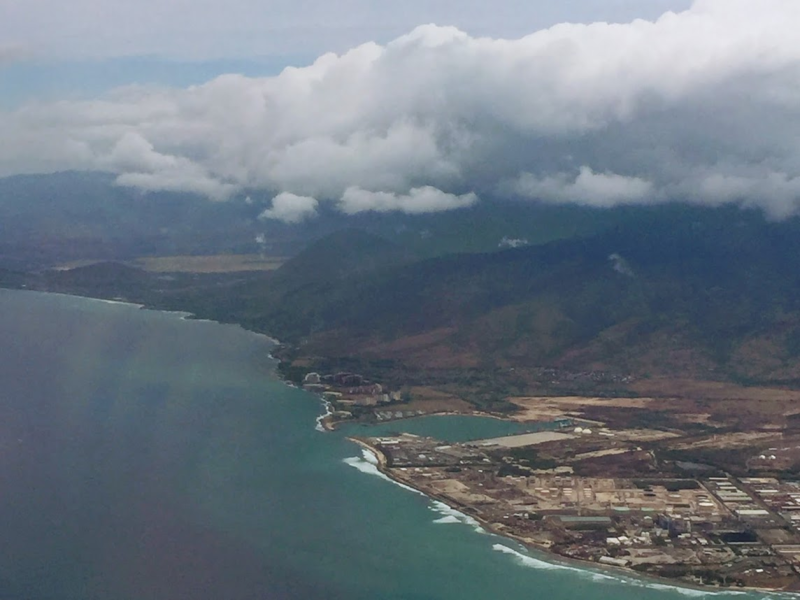 Coming in to Honolulu, we passed by Ko Olina. If you look really close you can spot Aulani! I was really excited to see paradise! 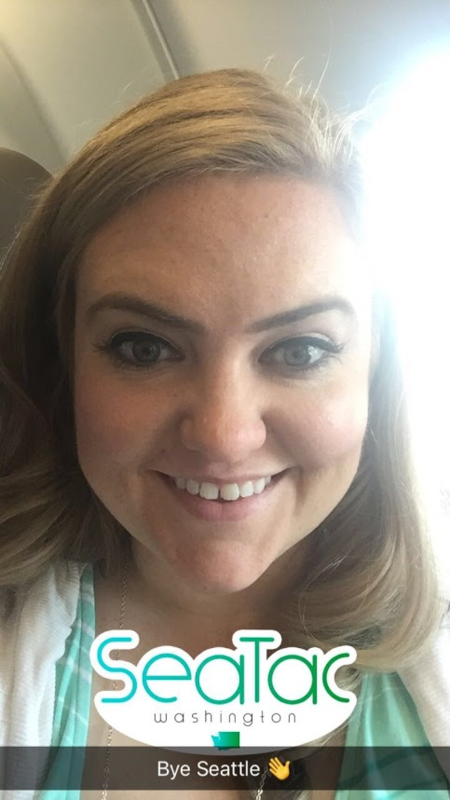 buzzrelly, chunkymonkey, MeghanEmily and 9 others like this. 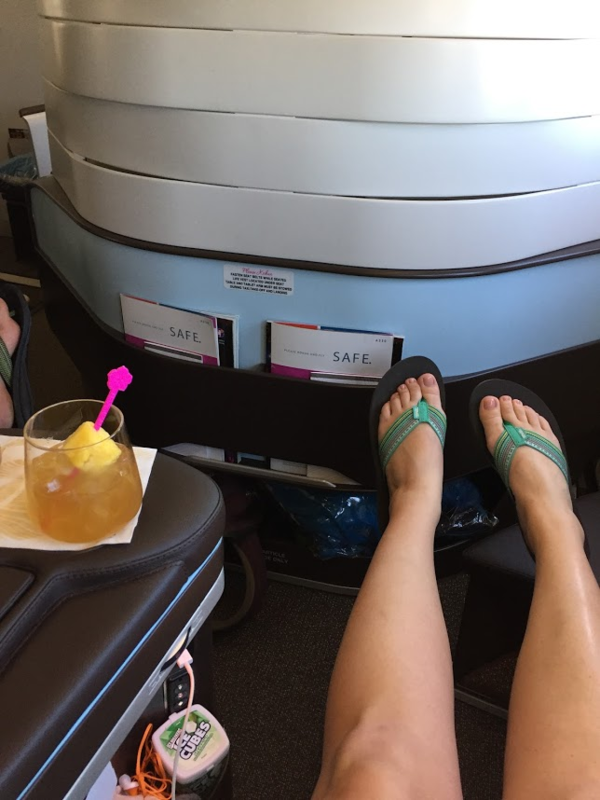 Upon our arrival into Honolulu, we had to wait for an available gate, and as a result we ended up at a gate not normally used for flights coming from the mainland. So it was a true adventure to find our way to the Alamo car rental (not helped at all by an airport employee who saw us looking around and sent us the wrong way). Eventually we were sent on our way with a Jeep that neither of us particularly cared for. 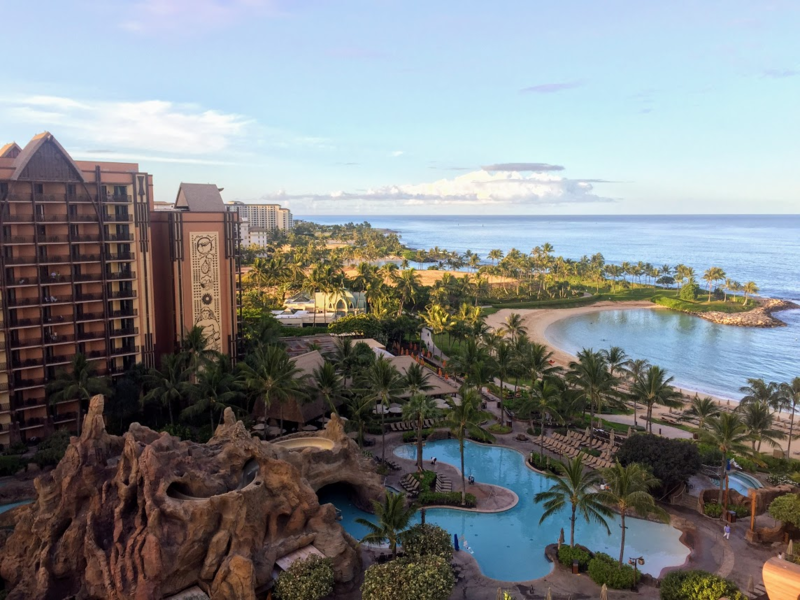 It took about 30 minutes for us to get to Aulani, and our room was ready when we got there so we went from the Alamo lot to inside our room at Aulani in less than 45 minutes. It was overcast when we dropped our bags off so you will have to wait on the room view pictures, I promise they are worth it! We knew jet lag would set in shortly and we had a limited window of productive time, so we headed straight to run the necessary errands - namely, picking up booze and food for the room. 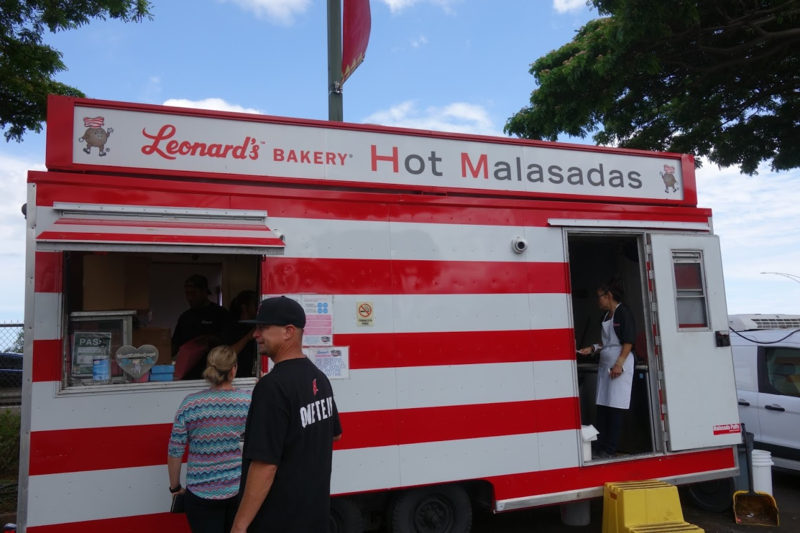 First stop, of course, was Leonard's, for the world famous malasadas! Yes, we did get a ton of them. Oh yeah! Check out those bad boys! 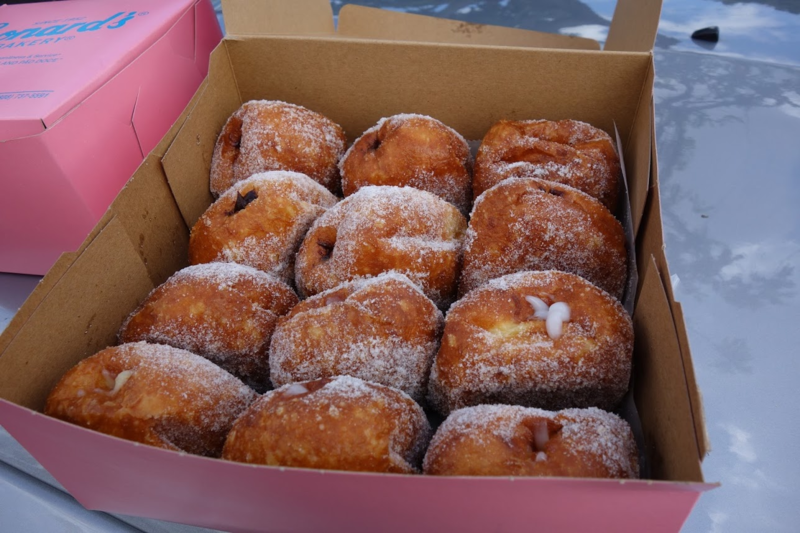 We got 6 original, 6 haupia (coconut), and 6 chocolate filled. Total including tax was $26.70 and they were so worth it! Especially hot and fresh. Our next stop was at the Safeway in Kapolei, and after doing all of our shopping there, paying, and leaving, we saw the wal-mart literally across the street. I am sure wal-mart would have been less expensive! We did at least remember bags. We bought fruit, frozen breakfast sandwiches, frozen hash browns, some ready-made pork, tortillas, salsa, chips, lettuce, other snack stuff that I can no longer remember, two kinds of liquor, a six pack of beer, soda, sparkling water, juice, extra plates and stuff and our total was $247.87. It was a little more than I had planned to spend on room supplies but it ended up saving us in the long run considering how many meals and cocktails we made off those supplies compared to the resort prices. For example, a bottle of rum was $27.99 and two mai tais at the pool bar were $27.00 (both before tax). So I think we did okay there. We had requested a high floor room with one of the straight across non-triangle balconies. We did end up with a triangle balcony but ultimately really liked the room location and were glad that the high floor request was honored. I never did get over the incredible view! It was still a little overcast but the sun was definitely on its way out. We unpacked our groceries and relaxed in the room for a little while before heading down to check out the resort. 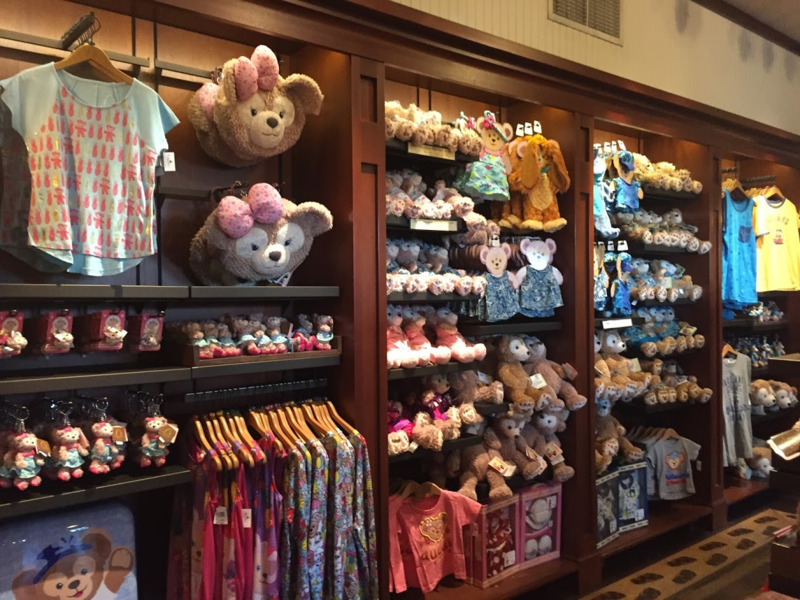 That's a lot of Duffy and Shellie May merch! 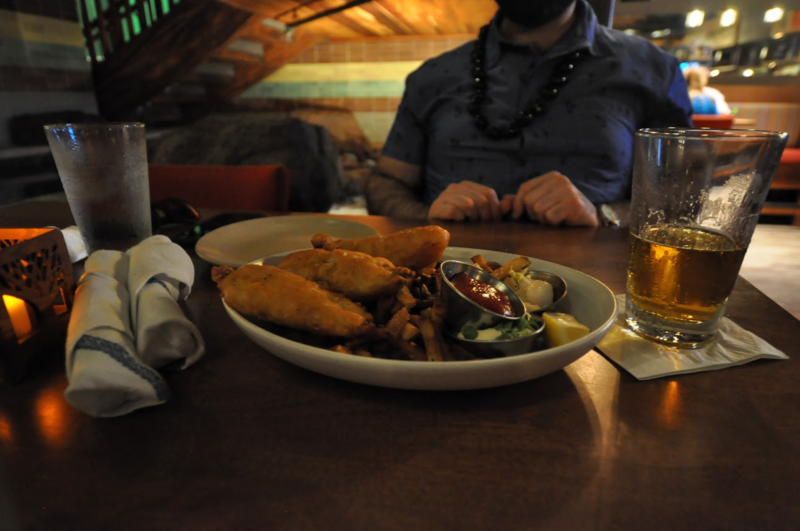 We found the Olelo room and helped ourselves to a couple of seats on the patio. There was live entertainment, and if you have ever seen them, you will know why I won't ever forget that this duo is Sonny and Marsha Marsha Marsha. They must have said it after every single song! Still, it was pleasant, and her instrument was pretty cool. It's a washboard with a wooden handle and a rope. 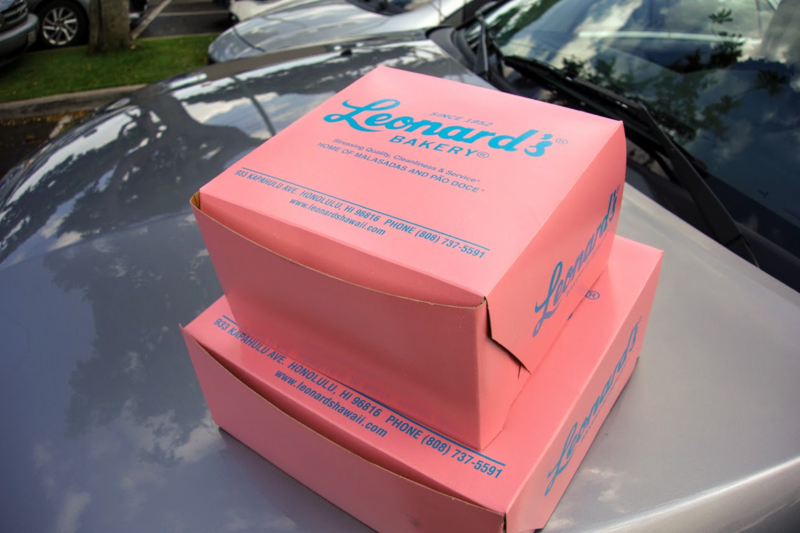 These were a pretty good value for Hawaii, but they were just "pretty good" and not great. I did not feel the need to go back for them again. 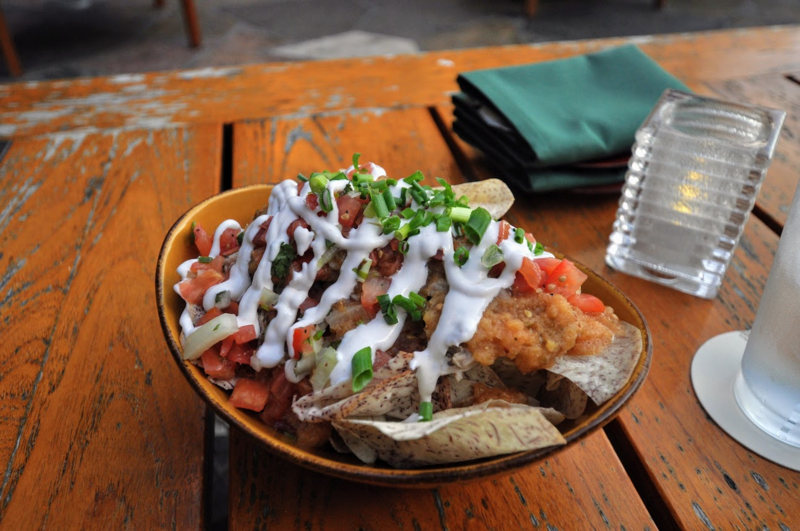 The taro chips were an interesting twist on your usual bar nacho. We also ordered a round of cocktails. I had the Summer Greyhound with Absolut Vodka, Wild Turkey American Honey, Ruby Red Grapefruit Juice, Lychee, and fresh lemon juice topped with soda water. ($13.50) It was very refreshing. 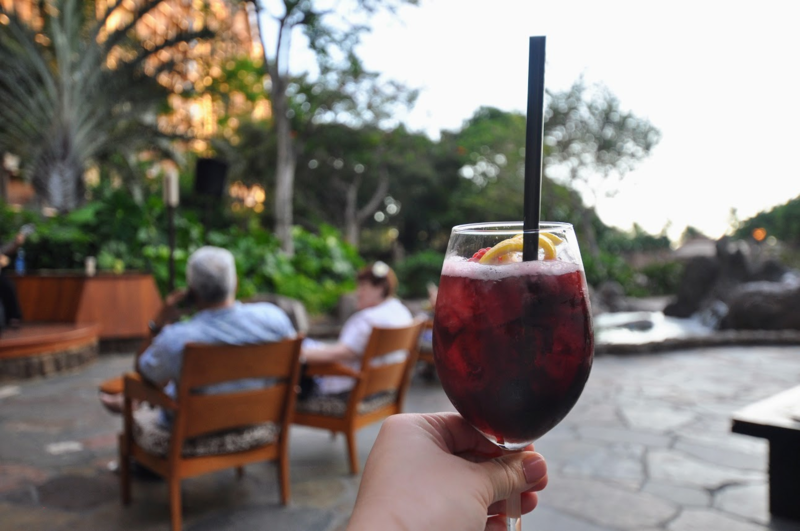 R had the Island Red Sangria - Eppa Organic Red Sangria topped with Absolut Berri Acai Vodka ($13). I think he just panicked and picked something as this is not something he would usually go with at all. I don't think he liked this as much as I did mine. I tasted it and it was fine, but pretty basic. 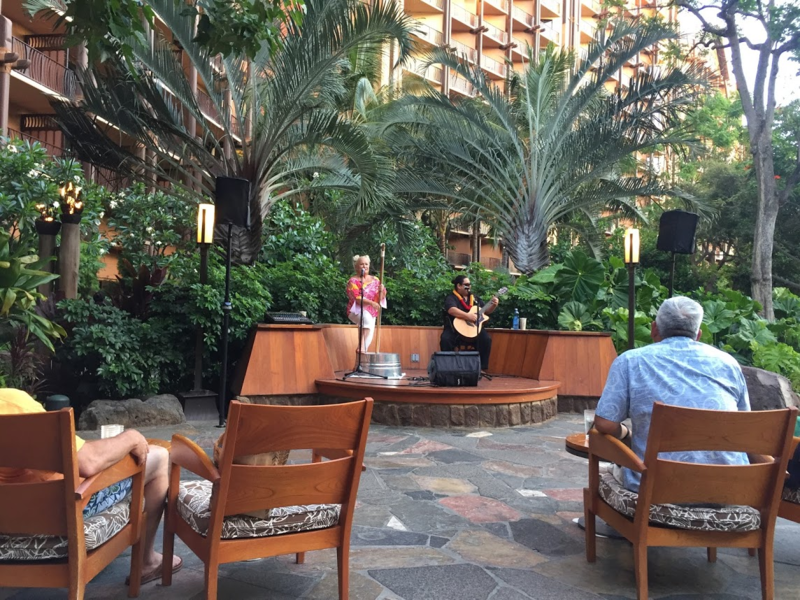 We had a nice relaxing time just listening to the music and enjoying our drinks, soaking in the Aulani ambiance. I could see doing this several times during my trip if I had a longer stay. Our total was $37.17 not including tip. I can't describe how immense and grand the resort feels when you're inside it. There is definitely some Hawaiian magic in there air there. At this point we were just trying to follow jet lag advice and stay awake as long as possible, so we headed across the street to Monkey Pod. 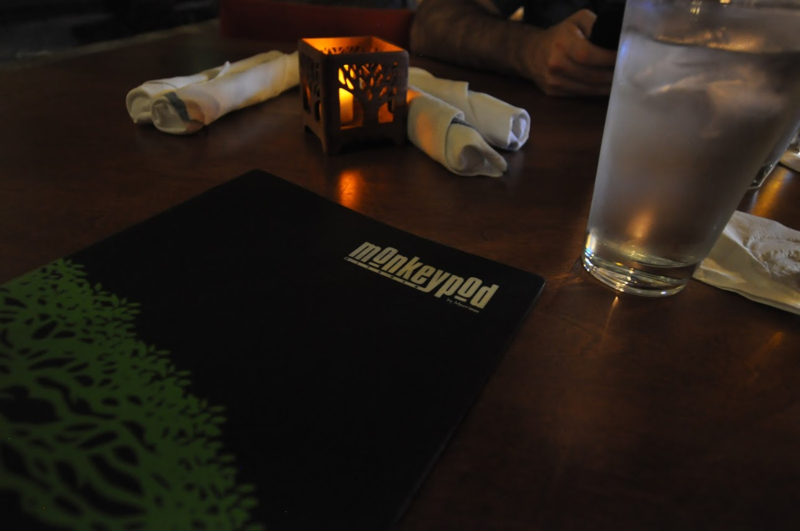 Even after reading so many reviews of Monkey Pod, I was not sure what to expect. I would call it an upscale casual kind of restaurant. 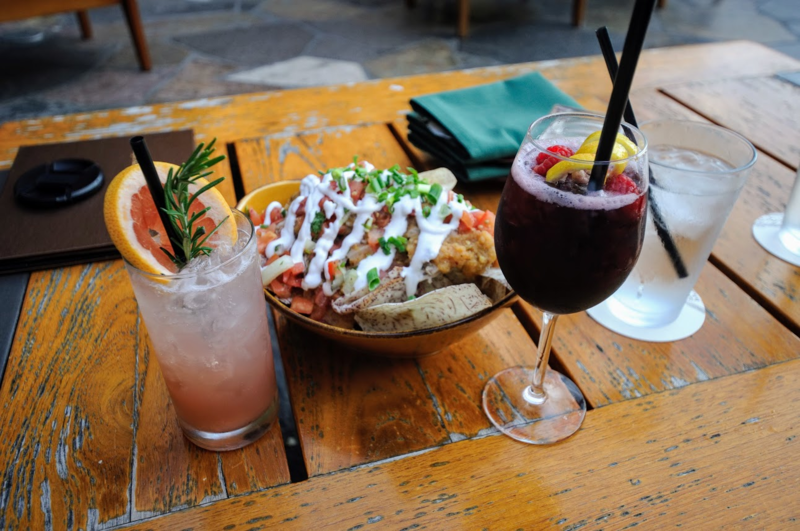 There is indoor and outdoor seating and live music on some nights, and while the food is good and there is an emphasis on fresh ingredients, it's nothing fancy. We were seated next to the bar in a booth, which was fine. We were near a fountain/water feature which I recall being loud but we were just so tired it did not matter. We each ordered a local-ish beer: I had the Maui Brewing Company Mana Wheat and R picked the Maui Brewing Company Big Swell IPA. We were pleasantly surprised by how many beers were on draft and our server did a fairly good job with his recommendations. 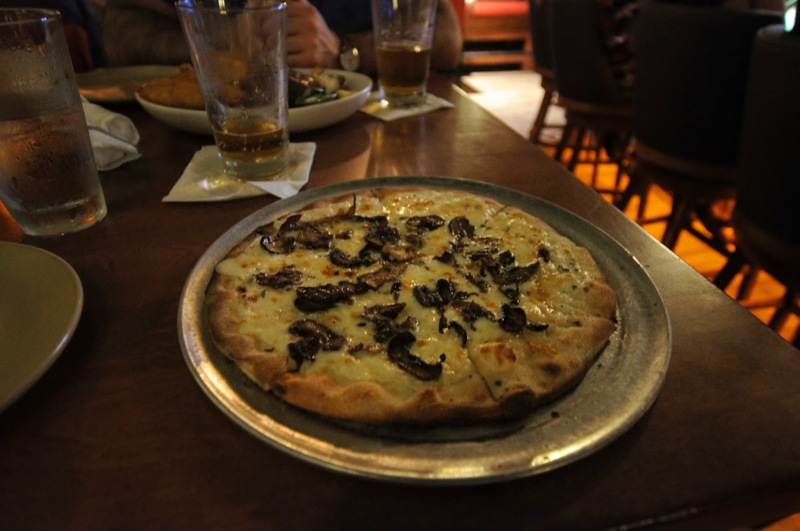 Hamakua Wild Mushroom & Truffle Oil Pizza - $18.95 white sauce, garlic, parmesan, fresh thyme. Anything with truffle oil is up my alley, and while I wish I had gone farther afield than "pizza" on our first night in Hawaii, this hit the spot and filled my tummy nicely. R chose Pete’s Fresh Fish & Chips - $23.95 day boat, troll-line caught mahi mahi tempura style, malt vinegar aioli. These were really good but for $24 the portion of fish could have been bigger. The fries were good but a little greasy. One of us had a second beer - we might have shared it, I can't remember. Total for three beers, a pizza, and fish & chips with tax before tip came to $70.58 . We walked back to our room and crashed immediately! We had big plans for the next day that would cause us to rise bright and early. Up next: visiting Diamond Head! buzzrelly, chunkymonkey, MeghanEmily and 8 others like this. I’m in! 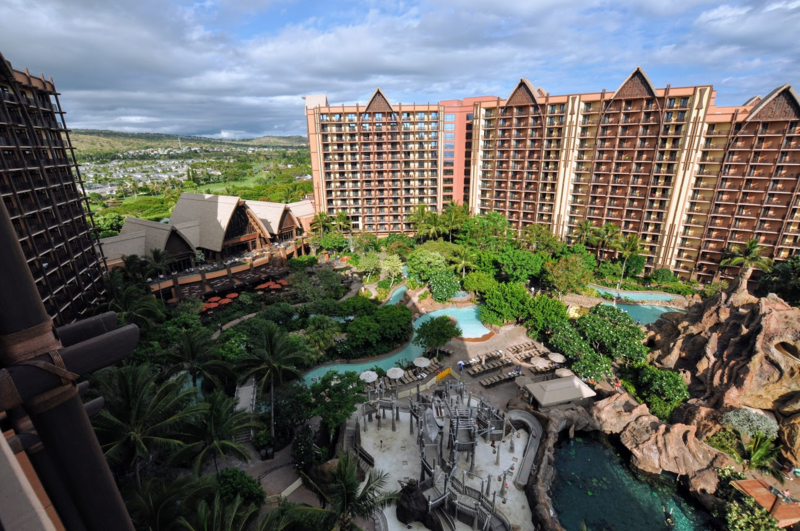 Aulani is on my bucket list and I’m trying to learn all I can and file away tips. Congratulations on your engagement. I’m looking forward to the story - you’re an adorable couple! Sounds like first-class is the “only” way to manage such a long flight. 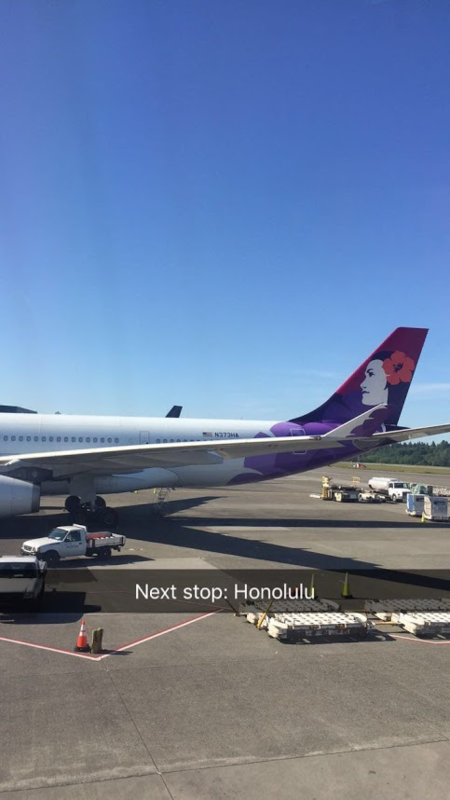 Hawaiian Air looks amazing! Hurrah for arrival and getting squared away with supplies. Bringing bags, Leonard’s and Monkeypod are all on my list! Looking forward to more!! bajadahl I am the Pirate your mom warned you about!!! Thank You! Really appreciate you adding the cost of shopping and various meals. 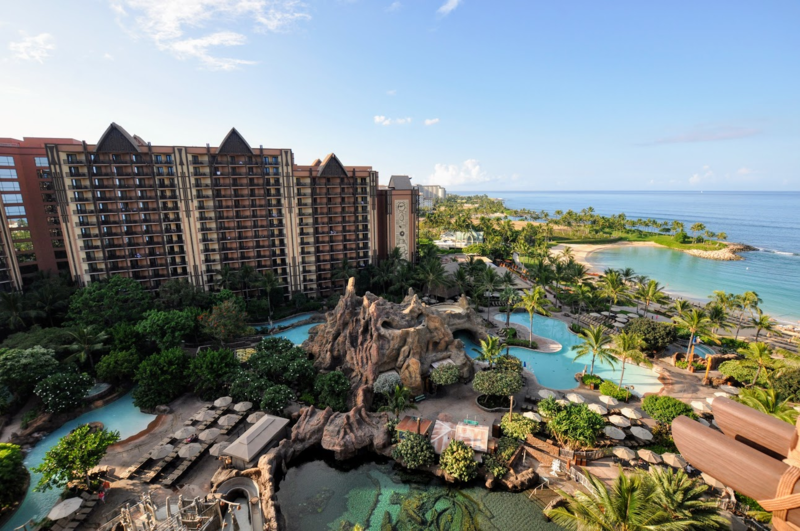 We are going in to Aulani in early July (kind of unexpectedly after our extended family had to cancel a different itinerary) So I am way behind on figuring our budget. Loving the pictures and super cute couple as well. Congratulations! Yay for you finally doing this! 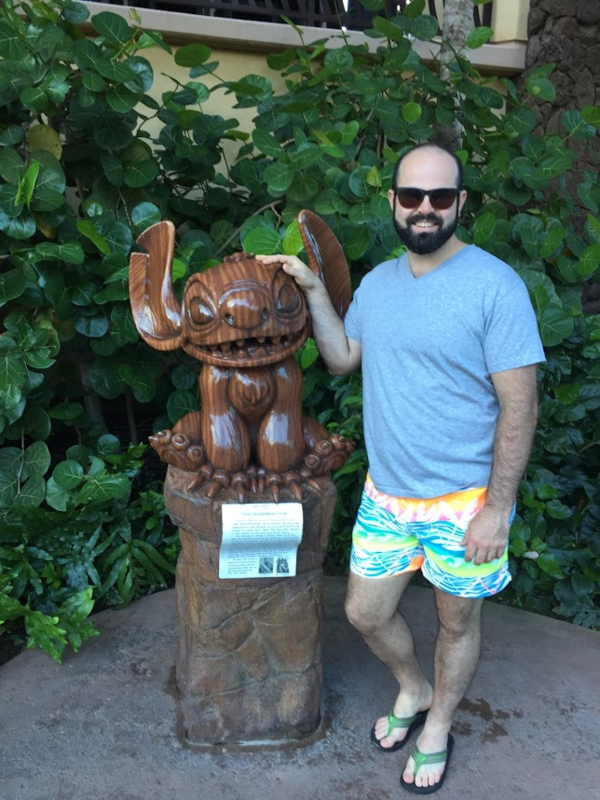 Aulani for 30th birthdays are the best! Looking forward to the rest. Great pictures. Thanks, Christine! Glad to have you along. Aulani is a dangerous bucket list item as now I tell R about once a week that I am ready to go back. The story is coming up shortly - lucky got my readers, R couldn't wait long with such a big "secret". 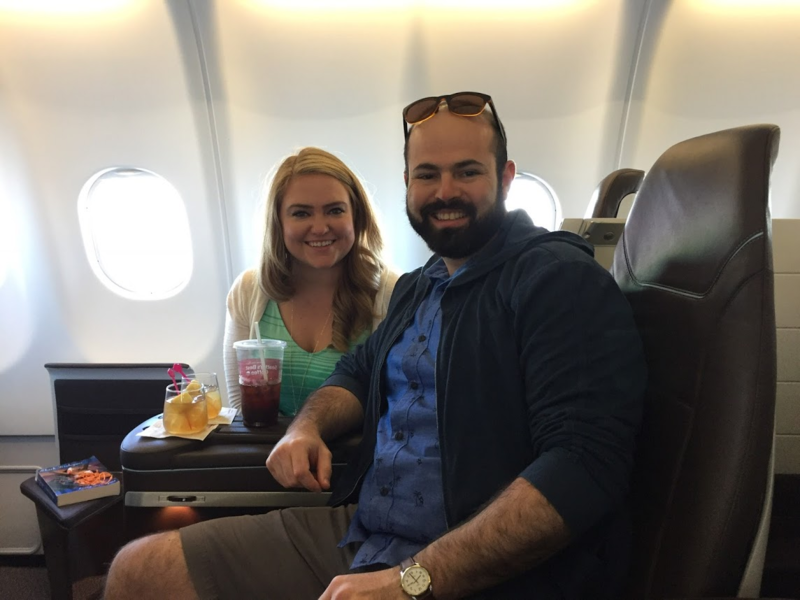 We were lucky to score such an amazing deal on the first class multi-leg tickets. I think it's worth what we paid but it was only a couple hundred dollars more than the comfort plus seats were, and even though Atlanta has direct flights, I really think the shorter connecting flights helped us handle it better. I saved or took pictures of as many receipts as I could to try to help other people with their plans. I'm terrified to see the total, but it's all been paid for so I guess it won't hurt too much. I forgot to mention that our grocery tabs (there's another one on Kauai) also include some fancy Hawaiian coffee, for us, and for souvenirs. I couldn't resist. And thank you for your well wishes and for joining me! Glad you found me your Aulani report helped me so much! So just paying it forward!!! Thank you! I rented a couple wide angle lenses for this trip. I tend to stick with Point and shoot or iPhone pics on our other trips but this was one worth lugging the DSLR for! Following along - love all the pictures - truly beautiful. 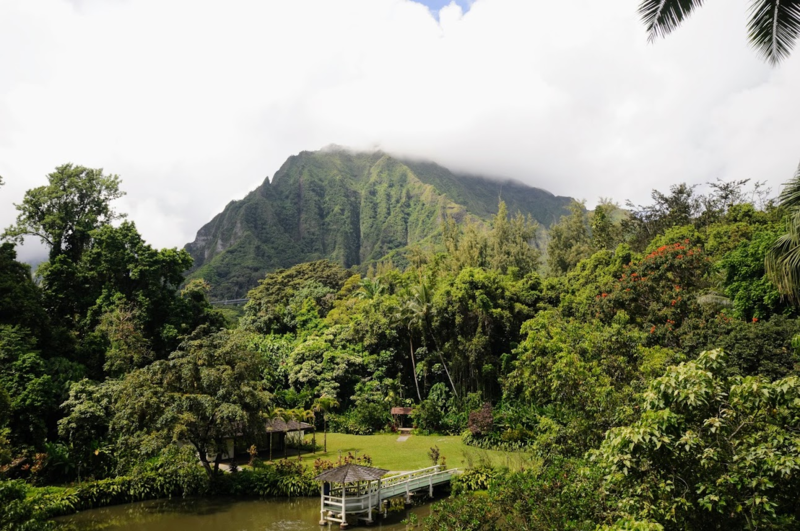 We are hoping to get to Aluani Nov/Dec 2019, plus your title caught my eye "Dreams come true in Blue Hawaii" being an Elvis fan and that being my favorite movie of Elvis's did it for me. Congrats on your engagement. Thank you, glad to have you here! 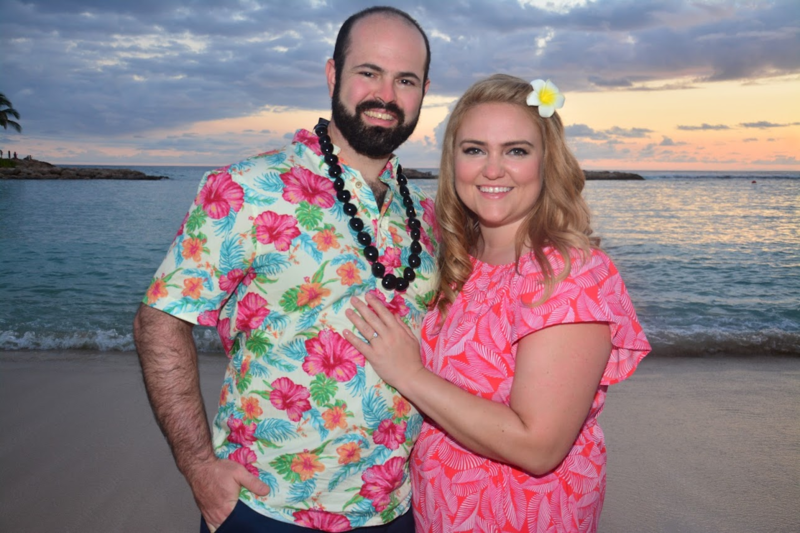 I love that Elvis song too and have been listening to both Blue Hawaii and the Hawaiian Wedding song an awful lot while working on wedding plans! 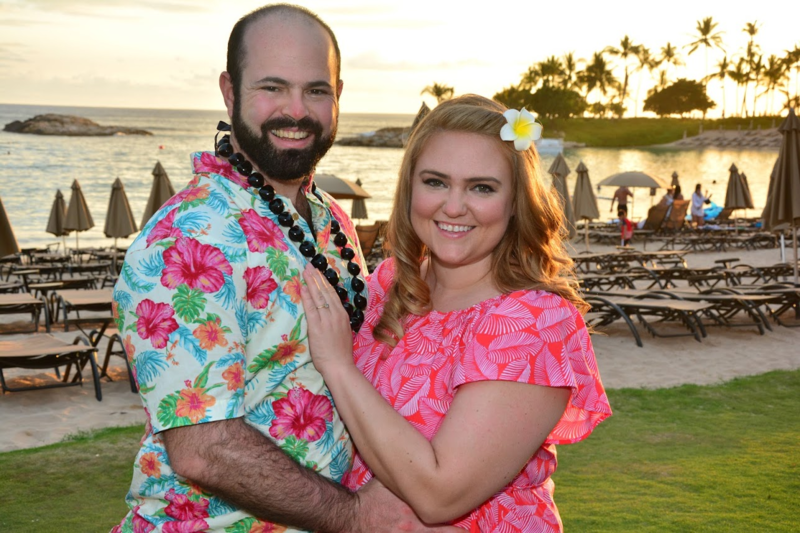 I hope some of what we did helps with your Aulani planning. 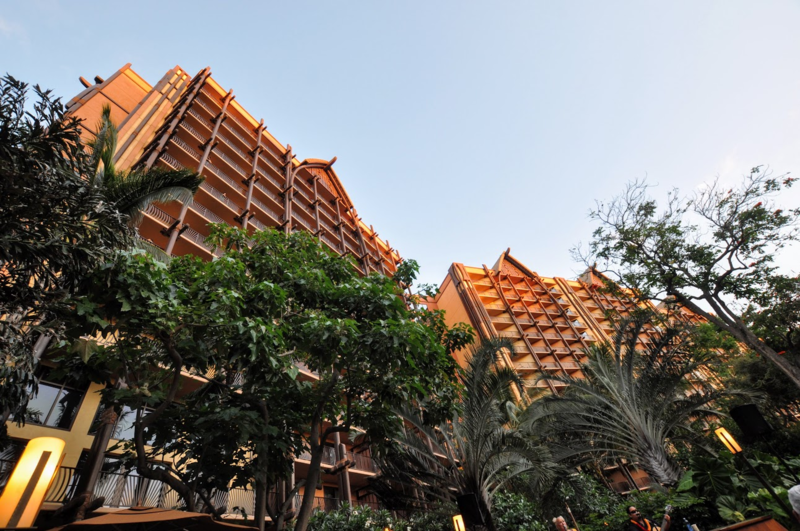 I know I read tons of reports before going to Aulani myself and they were very helpful! So when we woke up the next day, I knew something was up. R wanted me to hike up Diamond Head in a dress. 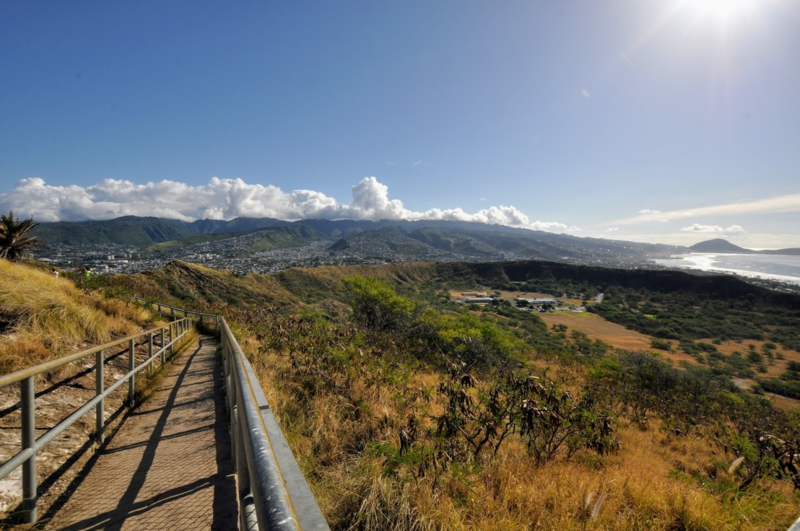 Now, I've done plenty of easy hikes in a dress (with shorts under) in the past but I had read lots of reports on just how many stairs there were at Diamond Head so I was NOT planning on dressing for style. Since he suggested a particular dress, of course I wore it, but I pretty much knew exactly what was up. (He is a smart man, and had asked me many months before what I wanted my engagement ring to look like, and covertly ordered it. But then about a month before our trip there was an elaborate ruse about going to his brother’s house to meet a friend, and let’s just say my spidey senses were on full alert prior to the morning’s weird outfit suggestions ). 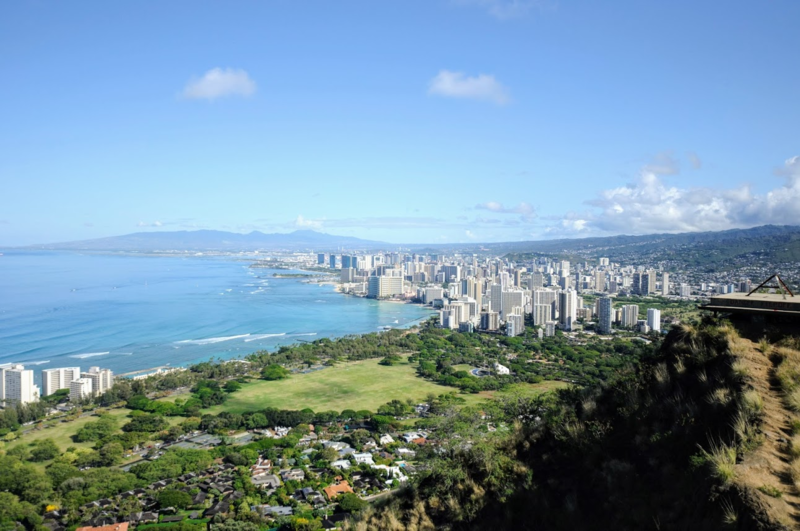 We got out of the resort pretty early and arrived at Diamond Head around 7:00 am - I had planned to arrive earlier since we were taking advantage of the jet lag and the fact that we awoke so early on our own. We were almost too late to get a parking spot in the main lot at the trail head, and it warmed up quickly while we were enjoying the park, so I really advise getting there as early as possible. 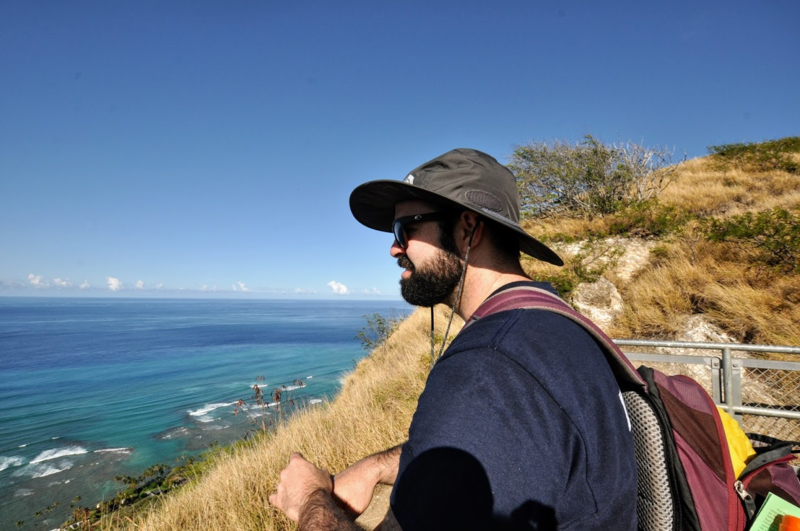 I would also recommend looking at the Diamond Head website and at the trail maps on there - I am in slightly better health now, but after having read others’ reports on the Diamond Head experience, I knew that the enclosed stairs portions as you are nearing the top of the climb would be a likely trigger for a panic attack for me. We were able to avoid the worst of them by going “up” the “exit” - really there are people going up and down both ways, and we just took advantage of the more gradual sloping paths to reach the top rather than climbing those narrow and claustrophobic stairs. 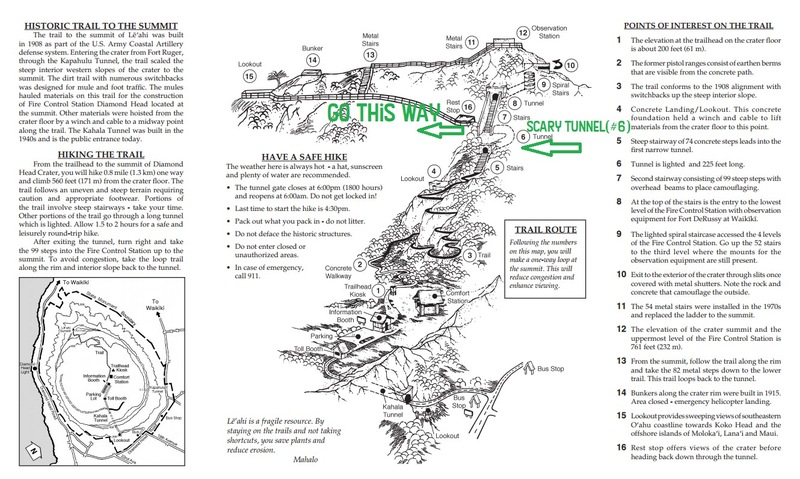 Note that if claustrophobia is a significant concern, you should not do this hike. There is an unavoidable tunnel to reach the observation station at the top. If joint pain or other health conditions are of concern to you, I would highly advise getting a map and avoiding those second and third sets of stairs like we did. Of course, we stopped plenty of times to take tons and tons of photos. 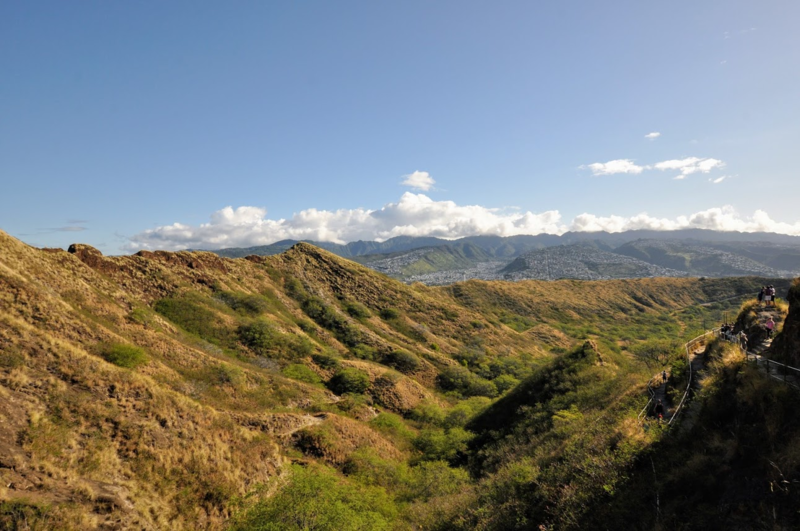 It really is a lovely view and from portions of the ascent, you can get an idea of just how populated Oahu is in areas. Upon reaching the observation deck, I took about a million more pictures, we took pictures of each other, and we even got another visitor to take a photo of us. And... nothing from R... so I’m thinking “well what did I wear this dress for?” when R asks the camera man to take one more photo of us and fishes out the ring. We have a little video of the end of the proposal, and a couple of candids of R “popping the question”. I, of course, being so excited, can’t remember all of what he said - it was very sweet and very "us" but the important part was that he asked me to watch Jeopardy with him every night for the rest of forever and of course I agreed. Afterward, he admitted he did not think the climb would be so rigorous and he was sort of envisioning a walk in the park with not too many people around. That is NOT what Diamond Head is, so this is kinda funny in retrospect. 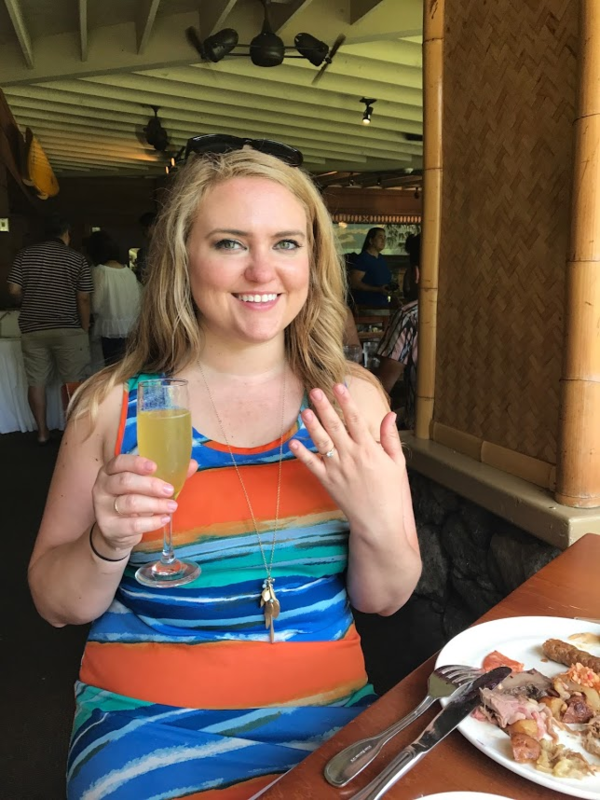 Obviously, Diamond Head now holds a very special place in both of our hearts as the scene of our engagement, but I really don’t understand why so many posters here on the Aulani boards have recommended skipping it recently. 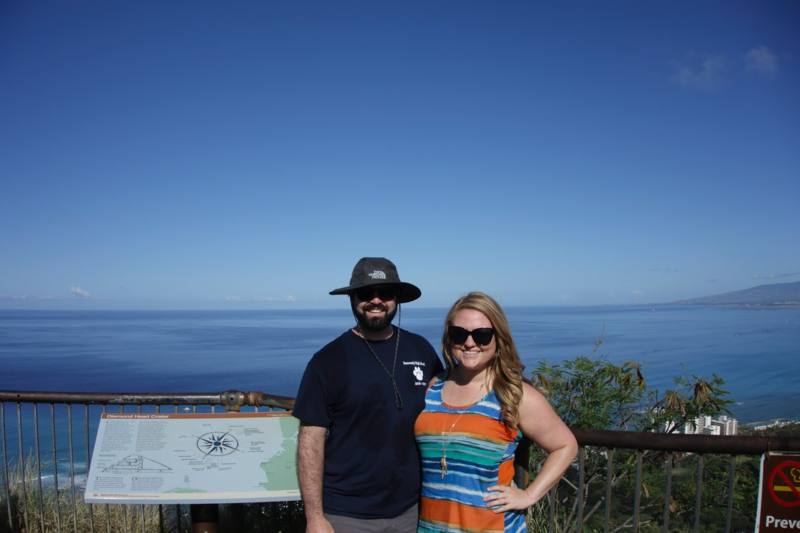 We loved it as our first day activity - you don’t have to plan too much (other than to arrive early) and the full experience provides an incredibly scenic view out over the island. 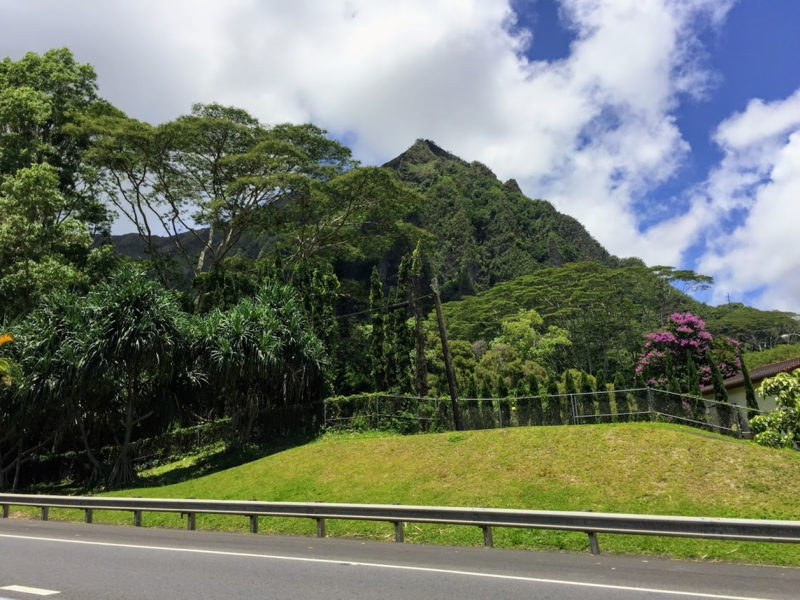 I feel like it really set the tone and prepared us to enjoy Oahu, especially since we had no interest in visiting Waikiki or Honolulu in general. I think history and military buffs might especially enjoy those elements of this experience but even if you are just there to look at the pretty view, I found the experience to be worthwhile. I also purchased my favorite souvenir there - a Diamond Head (Nalgene style) plastic water bottle that I use every day now and it reminds me of that beautiful morning. We found the gift options at the ranger station in the parking lot to be relatively few but worthwhile and reasonable in price. 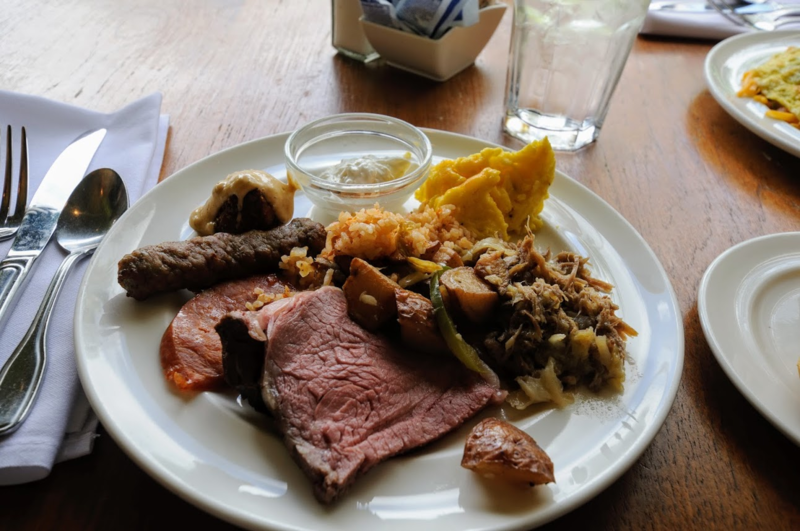 We were starving after all the morning’s excitement and decided to try a restaurant I’d read great things about, which served a highly recommended Sunday brunch buffet. Haleiwa Joe’s at Haiku, not unreasonably far from Diamond Head, was to be our destination. Spoiler alert: this was one of the best meals of the trip. If you can reasonably fit this stop into your island touring plans on a Sunday while you are visiting, you absolutely should. Upon arriving, we had a bit of a challenge finding parking (first good sign, okay this is popular!). We did snag a spot and put our name on the waiting list - the hostess told us it would be an hour so we elected to tour the expansive and lush grounds. 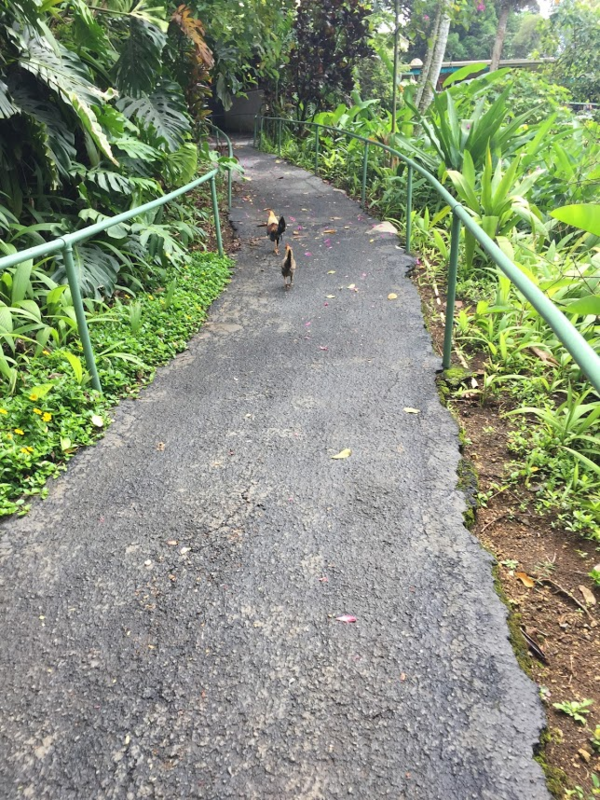 We found their wedding chapel and the first of the trip’s chickens - I found them hilarious but they became old hat on Kauai. The restaurant is indoor-outdoor, sort of open air like a lot of places in Hawaii, and our table was under an overhang but basically in a “front row seat” to this dramatic vista. 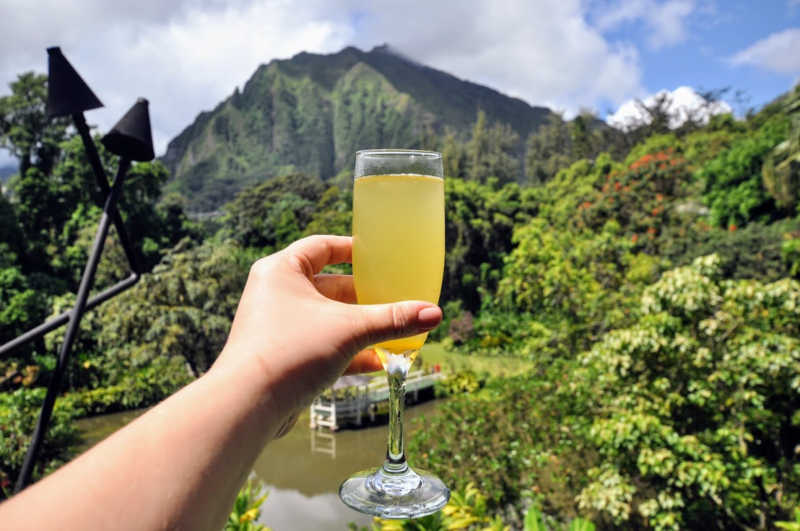 We each got a passion fruit mimosa ($4.50, yes in Hawaii!) and the brunch buffet. The adult price of $26.95 was a great value - the selection included fresh carved prime rib (this is their most famous dish and they often sell out at dinner, from what I gather), an omelette/eggs your way station with a fantastic entertaining chef, your typical waffles and pancakes breakfast fare, Kalua pork and rice, Hawaiian sausages, fresh fruit, a selection of salads, and a few seafood and savory offerings. The buffet was not a giant variety - there was certainly plenty to choose from - but it wasn’t the usual buffet issue of sacrificing quality for variety. 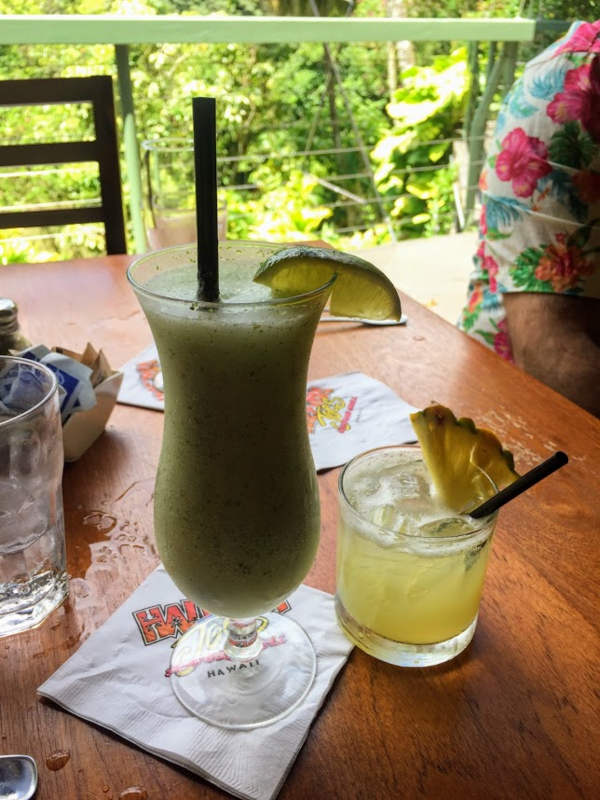 Later we got a second round of celebratory drinks and they were $9.00 each - much better than Aulani prices. R had a Hawaiian variation on a Long Island iced tea while I had The Lime in The Coconut. We both liked them and we enjoyed lingering. 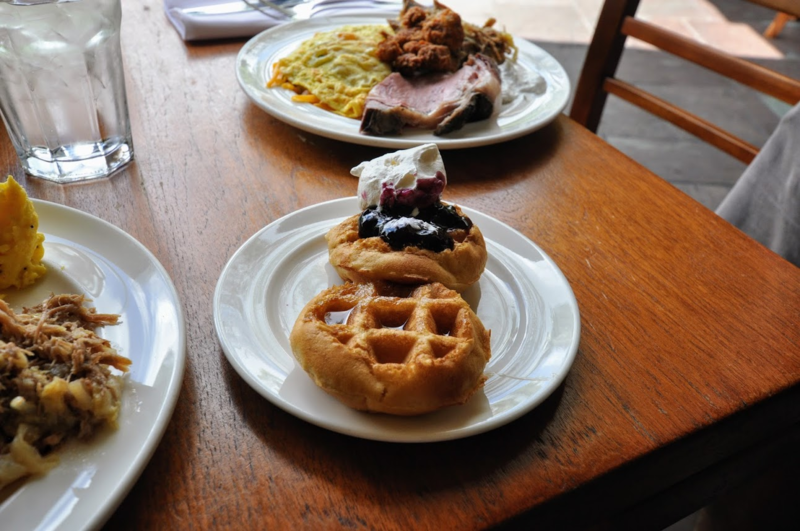 While there were absolutely other tourists here, this brunch looked more like a special thing for locals. We saw a few graduation celebrations and lots of what looked like local families out before or after church. Total before tip was $84.71, maybe the best value of the whole trip considering the quality of the food and the ambiance. This installment is getting long but I don’t have many more pictures from this day so I will wrap up the whole day in one post. We drove back to Aulani and found a couple of lounge chairs at the adult pool - it was packed this day (Sunday of Memorial Day weekend) and we settled for less than ideal spots mostly in the sun and far away from the pool. We just relaxed for the balance of the afternoon, talked about what we might like to do for our wedding, and had a dole whip from Ulu Cafe. 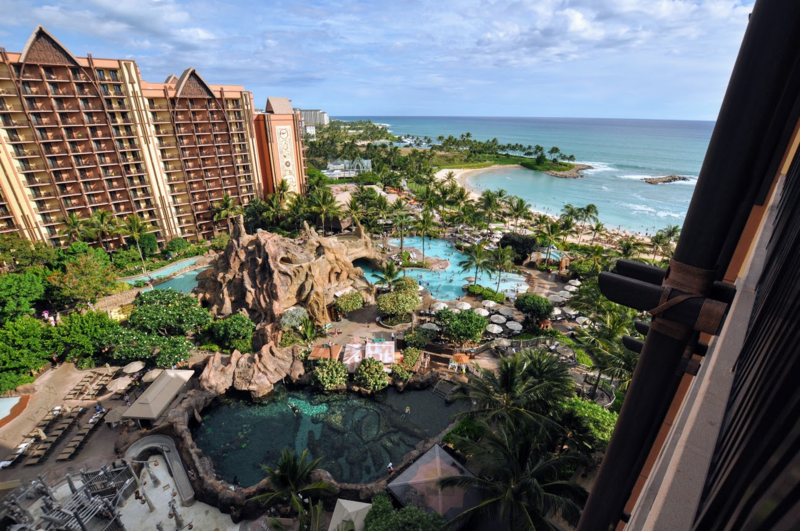 If you are an adult couple wondering whether Aulani is right for you because it’s Disney, I have to say the adult pool really makes a difference. It’s secluded and quieter, with chair service from the nearby pool bar and it was right next to a side door into Waianae Tower, so it was really quick and easy to go back up to our room. We had dinner at Pizza Corner this night. We were again very tired after rising so early for Diamond Head but having refused naps to try to adjust to the time zone. We got a veggie pizza (probably large, I can't remember and the receipt doesn't say, but I know we had leftovers) and garlic knots for $34.03. The pizza took kind of a long time to come out and it was really hot inside the restaurant while we waited. I noted that the food was okay. We probably should have just gotten food from the Ulu cafe, but going across the street gave us something to do and we did snack on leftover pizza later in the trip. 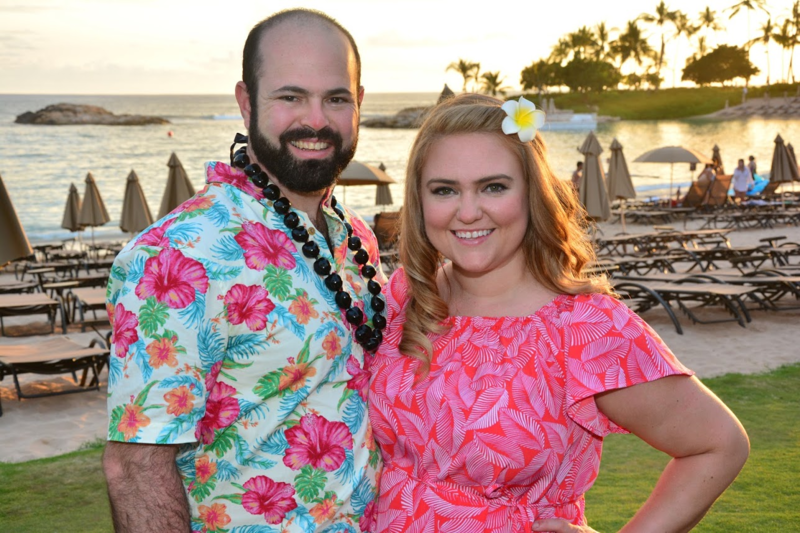 Up next: a resort day and a visit to Kona Brewing! buzzrelly, chunkymonkey, MeghanEmily and 11 others like this. 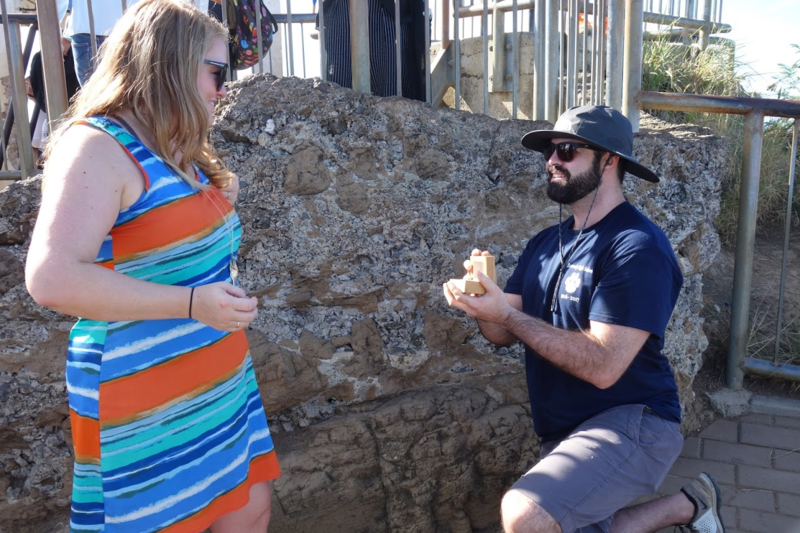 What a lovely engagement story! Congratulations!! LOL on your spidey senses. Good for you in playing along. The photos are beautiful. Thanks for the head’s up on potential claustrophobia triggers... I will definitely have to research that further. We visited Diamond Head when I was a kid and I don’t remember that but it was a long time ago and probably didn’t bother me then. Great brunch tip! The view from your table is fantastic and $4.50 for a mimosa?? Definitely smart to go where the locals go! And thanks for the photopass tip as I too have an AP! Glad to hear you were able to find a chair at the pool (albeit not in prime location but I’ve seen a lot of reports of chair hoarding/reserving) and that the adult pool is quiet and relaxing... and importantly with bar service! Amazing place to propose and to accept. CONGRATULATIONS! The pool chair situation definitely got better after Memorial Day weekend was over. We did not find it a problem to find chairs after that. Thank you so much! 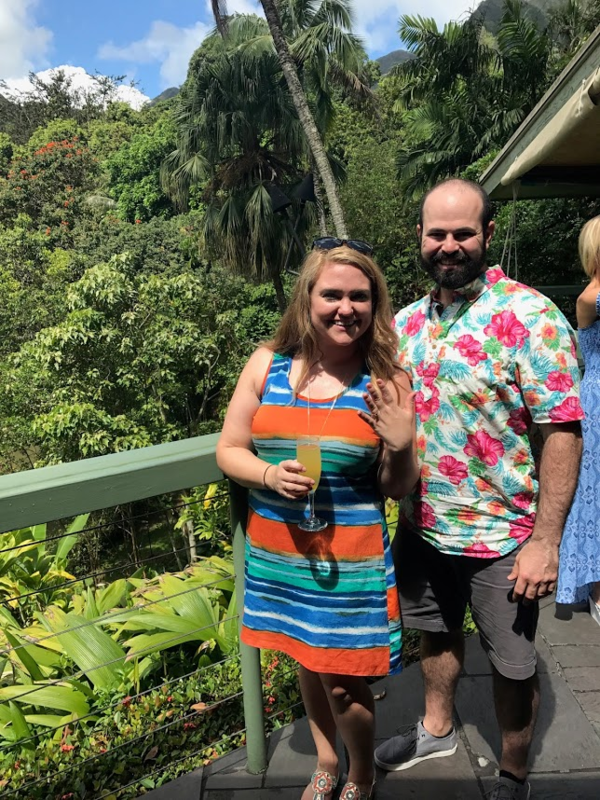 We loved our visit and it was a great place to get engaged. I might have preferred it not being in front of 100 other people but poor R had no idea what to expect at Diamond Head and couldn't manage the secret any longer... haha! tammy and 2xcited2sleep like this. I am loving your trip report. Congratulations on your engagement. 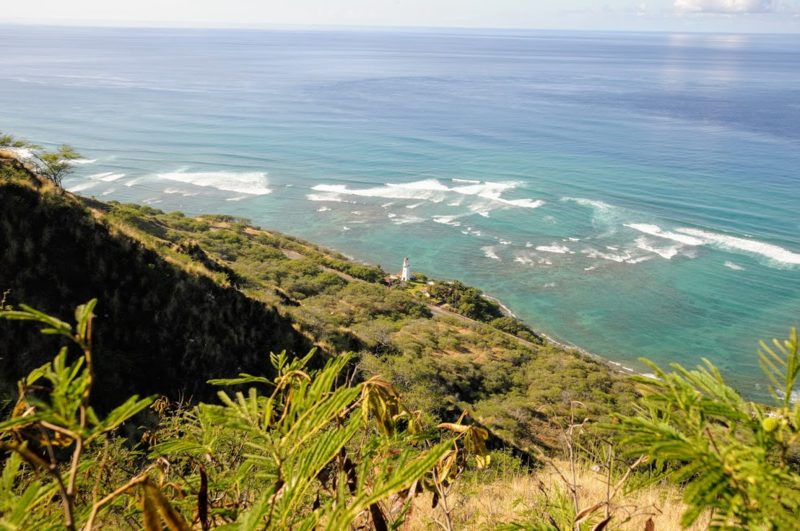 I was iffy on Diamondhead but now you have me convinced to do it. Casually finding my way over here without any self promotion or branding at all. Funny how that happeneds Coming back to catch up, but so here for the duration ! Excellent trip report! Love the great photos and your sharing the details. Thanks!